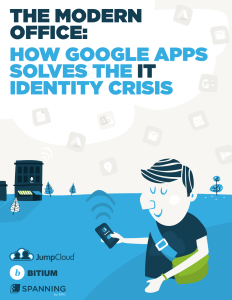 Need to Backup Data for Google Apps for Business? Home » Blog » Need to Backup Data for Google Apps for Business? Google has created an amazing cloud-based productivity suite with Google Apps for Business. From Docs to Sheets, from Calendar to Drive – Google Apps are easy to use, readily available, they encourage collaboration and they’re highly reliable. True, Google has done a great job building their cloud infrastructure. But Google’s side is only half of the equation. “You may be surprised to find out what happens when the problem is on your side,” explains Melanie Sommer in The Modern Office [free ebook]. In the ongoing battle between hackers and IT, no ground is safe. Whether your sensitive data is stored on servers on-premises or on the cloud, clever hackers are on the prowl. Anything stored on Google Apps is a potential target for theft and deletion. Your own employees are one of the biggest security threats facing IT. Nearly a quarter of electronic crime events are data breaches caused by people inside companies [CERT]. The danger comes not just from disgruntled former employees, but also from the well-meaning ignorance of staff whose behavior can make sensitive resources vulnerable. Everyone has made a big mistake with a critical document. Maybe it’s accidentally deleting an email, or maybe it’s making big changes to a document and then overwriting something important. Google Apps offers an environment that enables endless collaboration, but also endless chaos. Not surprisingly, human error is responsible for the majority of data loss incidents on SaaS-based applications [Aberdeen Research]. Here’s one that you may not have thought about. When you’re synchronizing a new device to a third-party app such as Google Apps, errors can occur that cause data to be lost. Sync error is just another reason to be vigilant when it comes to backing up your data. Depending on your industry, Google Apps may not be in compliance with industry regulations governing data privacy (e.g. HIPAA). Third-party apps that further secure and backup your data can bring your operations up to compliance with industry standard. So does an organization that’s using Google Apps for Business need to backup their data? Then How Do You Backup Your Data on Google Apps? If you want the short answer, that’s simple: the best way to backup cloud-based data is with a cloud-based directory or DaaS. If you want a more thorough, in-depth answer, then I recommend you take a look at the free ebook that we used to research this article, The Modern Office.